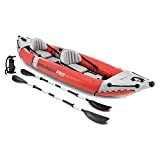 If you’re in the market for an inflatable kayak that is suitable for both professional and amateur kayakers, then you’re in luck with this Sea Eagle SE370 Inflatable Kayak. It is versatile, light, and compact enough for you to take it almost anywhere with you. It’s a great solution for kayaking lovers who just don’t want to deal with the bulk and transporting hassle that traditional kayaks bring. 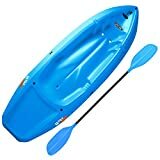 With an inflation time of less than ten minutes, this inflatable canoe saves you time and gives you a peace of mind while traveling. The design means that it’s suitable for up to three people or even soloing adventures. Whether you’re peacefully paddling on a lake or riding class II rapids, the Sea Eagle can handle it all. Read on to find out more about the Sea Eagle SE 370 Inflatable canoe, it was also featured in our best inflatable kayaks, you can check out the reivew here. We have included its specifications and features as well as consumer reviews to help you decide whether it is the right one for you. Weight (Inflated): ∼ 32 lbs. Weight Capacity: ∼ 650 lbs. Offers better speed and tracking through the two skegs placed on the bottom. The Sea Eagle SE 370 is perfect for use by families or even sole explorers. Regardless of who you are traveling with, it’s bound to be a great experience as you paddle your way across the lake. It’s also great for families with pets, as you are able to take your pet along on the journey. The bountiful leg room allows you to place one to three users on this, making this a great choice for larger groups or families paddling together. Just like any product, the Sea Eagle Kayak has its advantages and disadvantages. Below, we have compiled a list of pros and cons to help inform your decision. It ensures that you will not have to worry about storing and transportation with its ease of travel and use. Though this might seem like an obvious fact, it should be mentioned that this is an inflatable boat. Thus, it cannot and should not be expected to perform the same as a solid, traditional kayak would. Some blow up kayaks can give more to kayakers than traditional kayaks, with this being one of those. The Sea Eagle Inflatable is made of a very durable PolyKrylar material, which is a material that is often found in military equipment. The material ensures that it is be salt water and sun resistant. This rigid kayak is also extremely flexible, with the quality and weight, making it an easy to transport and store. All you need to do for storage is to simply deflate and pack up. The design is far from basic, as it’s designed to get through almost anything. Though this is marketed to be an entry level kayak, it is great for advanced and beginner paddlers alike. There is a high level of comfort offered through this design, which makes it less tedious for long cruises and touring. The cockpit area is designed to guarantee the maximum amount of comfort for all paddlers through the seat quality and extended leg room. 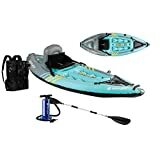 There are two blow up spray skirts placed on the kayak with one on the front and the other on the back, which allow you to keep yourself and your cargo as dry as possible. Though it originally comes with two seats, it can be manned by three people, depending on the total weight. It has been said to be able to handle up to 650 lbs., but it is likely to be able to handle slightly more solely based on the solid build. As mentioned above, inflatable kayaks cannot be expected to operate exactly the same as traditional canoes. Inflatable kayaks are more for recreational use rather than actual racing. This does not mean that they do not perform as well as sturdier, traditional kayaks, but they are simply not expected to be used for anything professional. They are designed to be a more relaxing sort of excursion rather than a toe-curling ride through the rapids. The Sea Eagle SE370 is a popular choice among kayakers, due to its storage, cleaning, inflation, and portability. It is often seen to be described as a ‘couch on the water’, due to its high level of comfortability. In comparison to other inflatable boats and rigid-shell kayaks, the Sea Eagle SE370 is praised for its value for money and affordability. Many agree that this is well worth the investment. On the other hand, a point of contention between owners is the lack of maneuverability and speed that the SE370 offers in comparison to other inflatables. However, the number of satisfied owners outweighs those that have complaints about the SE370.